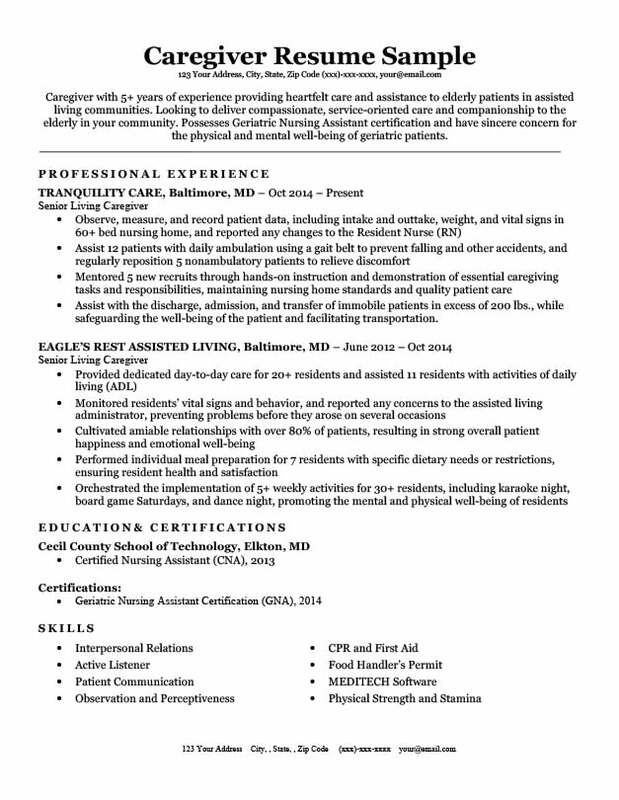 As someone looking for a job as a caregiver, before you can begin tending to the needs of the less fortunate, you need to give your resume the care it deserves. Our caregiver resume example and expert writing tips will help you cross the street to employment. On the other hand, if you already have your hands full looking after others, let our resume builder do the work for you! Not quite what you’re looking for? Check out our library of resume samples for the right one for you. Need some help with style? Peruse our free, downloadable resume templates for a step in the right direction. Done with your resume? Head over to our collection of cover letter samples for valuable tips. Caregiver with 5+ years of experience providing heartfelt care and assistance to elderly patients in assisted living communities. Looking to deliver compassionate, service-oriented care and companionship to the elderly in your community. Possesses Geriatric Nursing Assistant certification and have sincere concern for the physical and mental well-being of geriatric patients. Assist with the discharge, admission, and transfer of immobile patients in excess of 200 lbs., while safeguarding the well-being of the patient and facilitating transportation. To be a caregiver you need to have a genuine desire to help those in need. However, having a good heart and being dedicated to the tender loving care of the disabled and elderly is not enough in the eyes of a hiring manager. 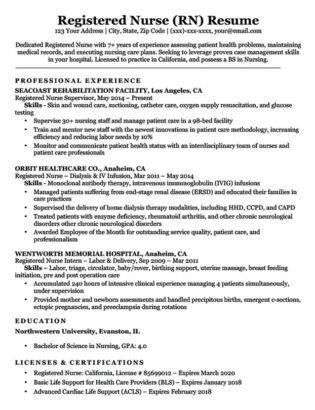 You need to use your resume to prove that you have the proper skills, training, and certifications to work in an assisted living community or nursing home. These four tips will help you accomplish that task. The career objective (also known as a resume objective) is arguably the most important section of your resume. It is designed to be the hook that allows you to reel the hiring manager in with the rest of your resume. More specifically, it is a three sentence opening statement demonstrating that your experience, skills, characteristics, and certifications make you the right person for the job. Caregiver with 5+ years of experience providing heartfelt care and assistance to elderly patients in assisted living communities. Looking to deliver compassionate, service oriented care and companionship to the elderly in your community. Possess Geriatric Nursing Assistant certification and have sincere concern for the physical and mental well-being of geriatric patients. As a caregiver, it is also a unique opportunity to showcase your personal characteristics that are difficult to express through your professional experience and skills. Most notably, your genuine desire to care for and help others — something hiring managers in assisted living communities are looking for. Take a look at our resume objective guide and examples for more details on how to capture the hiring manager’s attention! We did this in our example by adding a few choice adjectives such as heartfelt and compassionate. We also added a little extra bonus to our last sentence: have sincere concern for the physical and mental well-being of geriatric patients. The adjectives you use in your career objective (and throughout your resume) are extremely important because they can give the hiring manager a strong impression of your passion for the job. This is especially useful for someone applying for work as a caregiver. Since the particular needs of any individual differ, the responsibilities of a caregiver can be as numerous as the residents or patients they look after. Your professional experience is a good place to emphasize your versatility in performing a wide variety of different tasks. You can do this by listing duties performed in various categories important in caregiving. Assist with the discharge, admission and transfer of immobile patients in excess of 200 lbs…. In this way you can prove to the hiring manager that you are capable of dealing with any type of challenge that may be thrown at you. For details on how to craft strong bullet points like those in our example, check out the bullet point tips in our how to write a resume guide. Depending on the type of environment you will be working in, whether it be in-home, in assisted living, or in a nursing home, the skill set you need to put on display will be different. Additionally, the type of residents or patients you will be working with also has an effect on the skills desired by hiring managers. Simply put, you need to think about what skills the specific type of role you’re applying for requires. For example, if you’re working as an in-home caregiver or home care aide, skills related to food preparation, house maintenance, and companionship become more important. On the other hand, if you’re working with people with specific types of ailments such those on dialysis, you will need to demonstrate skills related to assisting with those treatments. What kind of people will you be helping? You also need to think about how important your skills are to the job, relative to your professional experience and certifications. For instance, if you work with residents with dementia or alzheimer’s, you might have multiple skills related to memory care that will be very important to the hiring manager. If you still feel lost when it comes to writing your skills, get a helping hand from our how to write a resume skills section guide. If you feel your skills are most important to the job, place your skills section at the top of your resume to ensure that the hiring manager gets the information they need with minimal effort. Similar to your skills, the certifications and training required for various types of caregiver work will differ. Pay attention to the specific requirements of the role you are applying for, and make sure you include the necessary certifications on your resume. Certain jobs may not require any training or certifications at all, whereas others may need specific types of training such as being a certified dialysis technician, or certified nursing assistant. If you don’t have the necessary qualifications for the role you want, don’t be discouraged. In many cases all it takes is a short training course to get you the fancy papers the hiring manager is looking for. Also, don’t forget to double check the specific requirements of your state. It would be a pity if you continually failed to land jobs in New Jersey, simply because you forgot to emphasize you have the necessary 75 hours required training on your resume.